New York: The Dial Press, 1966 262 pp with four color plate repros of cover art. 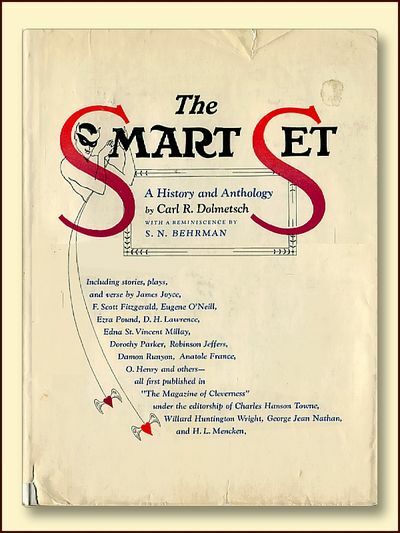 Including stories, plays and verse by James Joyce, F.Scott Fitzgerald, Eugene O'Neill, Ezra Pound, mD.H. Lawrence, Dorothy Parker, Edna St. Vincent Millay, Robinson Jeffers, Damon Runyon, Anatole Fance, O.Henry and others. The magazine's motto, "One Civilized Reader is Worth a Thousand Boneheads" still has a certain relevence. Text is clean, tight, unmarked. VG+ beige cloth boards have a drawing of Pan stamped in gold. Jacket is clean but has a number of closed tears. In Brodart cover. Oversized book, a bit extra for postage. Folio - over 12" - 15" tall Size: Folio - over 12" - 15" tall. First Edition.. Decorative Cloth. Very Good/Good. Dust jacket present. First Edition.